Ideal as an alternative to the First Person on Scene Intermediate (FPOSi) qualification, the QA Level 3 Certificate in First Response Emergency Care (RQF) also forms part of a progressive suite of prehospital care qualifications that lead to the QA Level 6 Diploma in Paramedic Practice (RQF). Endorsed by The Faculty of Pre-Hospital Care – The Royal College of Surgeons of Edinburgh, and fulfilling the competencies set out in the PHEM skills framework at descriptor level D, this fantastic qualification is perfect for a range of roles in emergency care, such as: Event Medical Responder, Emergency Care Support Worker and more. What’s more, the QA Level 3 Certificate in First Response Emergency Care (RQF) has been shortlisted for the Federation of Awarding Bodies (FAB) ‘Qualification of the Year’ Award 2018, and is one of the few first aid qualifications recognised by the Security Industry Authority (SIA). Over a 5 day period, Learners will gain the knowledge, skills and competencies needed to deal with a range of Prehospital care emergencies, such as: managing a patient’s airways, catastrophic bleeding, management of fractures, medical emergencies and more. For a more detailed overview of the topics covered, please download the Qualification Specification. 13 x Practical assessments, 3 x Theory assessments (Multiple Choice Question Papers), 4 x Skills tests and continuous formative assessment conducted throughout the course. Free Lesson Plan, Practical Assessment Sheets, Multiple Choice Question Papers and a Guide to Assessing Prehospital Qualifications. 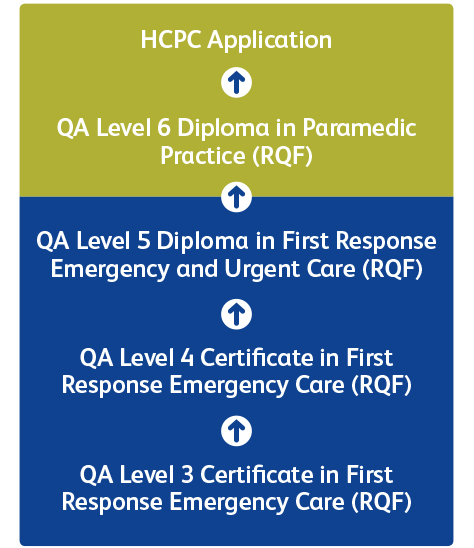 Successful Learners will receive a QA Level 3 Certificate in First Response Emergency Care (RQF) certificate personalised with their Centre’s details. Funding: This qualification is eligible for Advanced Learner Loans. For further details please click here.